All I can say is that this tuna embotido is the healthiest kind of embotido. Because tuna is rich in omega 3 fatty acid that is good for the heart. Cooking is also really simple and very similar to the pork embotido. The only pork that is added in this recipe is the pork bouillon. To cook tuna embotido; Marinate fish in pineapple syrup, 1/2 tsp iodized salt and 1/4 tsp pepper for 10 minutes. Drain and discard marinade. Chop fish then combine with remaining ingredients. Season with 3/4 tsp iodized salt and 1/4 tsp pepper. Mix well. Divide into 3 portions. 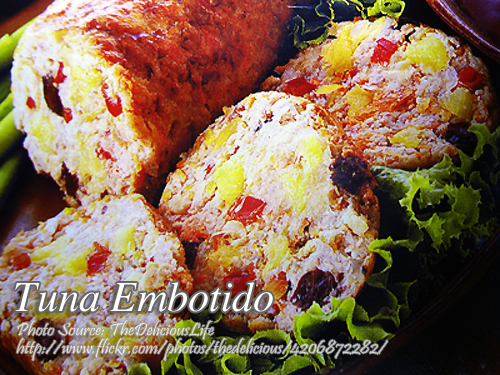 Wrap in foil then roll and shape into cylindrical shape, just like the ordinary embotido. Steam for 30 minutes. Cool. If desired, fry in oil and brown all sides. Marinate fish in pineapple syrup, ½ tsp iodized salt and ¼ tsp pepper for 10 minutes. Drain and discard marinade. Chop fish then combine with remaining ingredients. Season with ¾ tsp iodized salt and ¼ tsp pepper. Mix well. Divide into 3 portions. Wrap in foil then roll and shape into cylindrical shape, just like the ordinary embotido. Steam for 30 minutes. Cool. If desired, fry in oil and brown all sides. Slice and serve with banana ketchup. Hi Patricia, good luck on your cooking!